Fitness Center Austin: Got A Sweet Tooth? 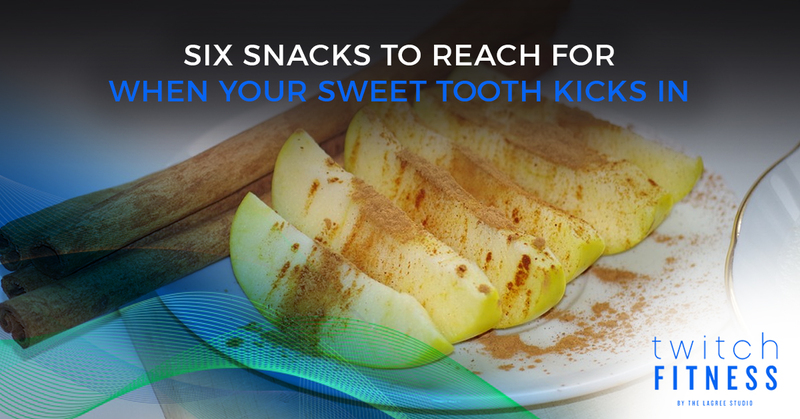 Try these Six Sweet and Healthy Snacks! The holiday season is quickly approaching which means there is going to be an abundance of pies, cookies, cakes, and other sweet treats. While indulging in some goodies is part of the spirit of the holidays, you don’t want all of your hard work to go down to the drain. Twitch Fitness, by The Lagree Studio, offers calorie-busting group exercise classes to help keep you healthy, happy, and fit – even after a second helping of pumpkin pie at Thanksgiving dinner. To make sure you aren’t being set back in your fitness journey, The Lagree Studio offers a body composition analysis test that can measure body fat, lean mass, and body water amount in under a minute. Schedule your body composition analysis today, or book your spot in one of our total-body fitness classes. If you do get tempted by all of the pumpkin spice and chocolatey goodness, try satisfying that sweet tooth with one of the healthy alternatives below! If you’re dying for a warm piece of apple pie, try baking some apple slices instead. Slice up an apple and lay the slices on a baking sheet. Sprinkle with cinnamon and bake at 400 degrees until tender. If you’re craving some crunchiness, top with plain oats before you place in the oven. ‘Nice cream’ is a recently coined term for ice cream that is super healthy. The most popular way to make this is to blend a frozen banana until it is the texture of soft serve ice cream. You can add cinnamon, cocoa powder, or vanilla extract for extra flavor. For extra sweetness, drizzle with melted dark chocolate or honey, add a dollop of whipped cream, or sprinkle with cinnamon sugar (yes, this ice cream is so healthy you can add sugar and still have it be a mostly-healthy treat). Want To Burn Major Calories? Book Your Spot In A Twitch Fitness Class Today! This classic treat is often overlooked on days other than Valentine’s Day – but who says you can’t have this healthy option 365 days a year? Use a semi-sweet or dark chocolate, dip the strawberries (or other fruits like bananas and pineapples), and place in the fridge until the chocolate sets. Cereal isn’t often looked at as a ‘sweet treat’ unless you’re eating Lucky Charms or Cocoa Puffs. However, this simple food can satisfy a sweet tooth when done right. Choose your favorite healthy cereal, a no-sugar-added vanilla flavored almond milk, and top with some cinnamon or cocoa powder. This is a treat you can use to fuel up before a workout, eat as a side with lunch, or snack on it any time of day. Here is a great recipe to follow, but the basic composition of this yummy snack is avocados, dairy-free milk, cocoa powder, honey, vanilla extract, and a pinch of salt. Blend it all up until creamy. Avocado chocolate pudding will have you feeling like a kid at recess, while still giving you healthy fats and antioxidants. Many people skip over popcorn when brainstorming for healthy snack ideas. After all, anything you eat in a movie theatre can’t possibly be healthy, right? Thankfully, popcorn itself doesn’t have very many calories (this obviously changes when you cover it in butter and cheese powder, but we digress). This popcorn is healthiest when you do everything yourself so you know exactly what is going into it. Heat up a large drizzle of oil in a big pan over medium-high heat. Oils with high smoke points like canola, peanut, or avocado oil work best for popping – but this can be done with coconut oil which adds an amazingly sweet flavor. Once your oil is heated up, add about a third of a cup of popcorn kernels and cover with a lid. Shake the pan to keep the kernels moving and prevent burning and continue to cook until there are several seconds between pops. To make this a truly sweet treat, toss with a bit of melted chocolate. If you want to burn calories, torch fat, and build lean muscle, try one of our Total Twitch Training (T3) classes at The Lagree Studio. Our Austin fitness center has three convenient locations across the city. Book your spot in a class today!